"And, by the way, it is through the extended family system that we look after our aging parents too. We never send them to old people’s homes. In that sense, I am sure we are closer to Bible times." I think, in general, this is right. However, in some cases where the elderly require a high level of care, it may be sensible to make use of a good Christian residential / nursing home where it is available. The other aspect of the welfare state is the control is gives to the state, which it often uses to impose a non-Christian agenda, e.g. here, or here. Thanks, Ben. I always appreciate appreciate your input. It helps me to see "the other side" of the coin. Thanks again! Thanks for the insightful article. Truly helpful to give me perspective outside of my own limited experience. We have adopted a child (from the states) and are praying about adopting again so this was a very interesting read for me. This is a challenging reminder, thanks. The extended family has been hit hard over the past 10 years. From retrenchments, economic hardships and high cost of living this family was the first to suffer. But what I think it has done is to expose the individualism in us.This has subsequently denied Christian families the opportunities to impact the extended family with the gospel. You will often hear parents complaining that these members of the extended family are of a negative influence their families. I totally understand this. But on the other hand I think that one of the root problems is our weak so called "Christian" families. When by God's grace these are strengthened then they will be able to not only, as Piper says, alleviate physical suffering but also eternal suffering. May the Lord help us to take this opportunities. So that when our mothers, fathers, sisters, brothers and children come to stay with us they will be challenged not only by our walk with Christ but also as we proclaim His name. Conrad, very insightful for the Westerner.. It was great to have lunch with you a couple of weeks ago in Springfield, Mo. I love how you pointed out that both "adoption" and the "extended family" are critical. Hopefully the work we are beginning in the Copperbelt will emphasize both. I look forward to visiting with you the next time i come to Lusaka. God bless your ministry. Thanks Pastor for your article - it has touched me. This is not just for westerners but is also very applicable in some aspects to us Africans who live in the west and sometimes despair due to the pressure to provide monetary resources to our other children, nephews, nieces, back home particularly for school requirements. It is easy to lose the perspective that our brothers, sisters etc physically sacrifice by taking these children into their homes and provide for their daily needs. Thank God for the generally favourable exchange rate; what is relatively less in the west, goes that much further when converted to the currency back home (The Lord himself adds the increase). We should not grow weary to do our part as God blesses us...it is a joy to see these children go through school, college, university and stand on their own and hopefully lighten some else's burden in the family. If through this the Lord grants that some become christians, greater is the rejoicing. Thanks, Conrad. I keep learning from the insights here. I pray that my mind will be open to truth and not encumbered by pride. It was truly humbling to hear you discuss the plight of the orphan and the family in Sub-Saharan Africa. I pray for your church and the people that comprise it. Excellent article Conrad, and very informative and helpful. Is your family or the families of your church the norm in Africa? What you describe is a Christian extended family that works Biblically (which is to say, very well). But when it doesn't work well? When the children taken into the home of the extended family member are abused and raped day after day, year after year? When children in an extended family member's home are really street children? Surely the horror of African homes that pay lip service to our Lord (not to mention pagan and Muslim homes) must be acknowledged. And then we come to the orphanages of Africa (and around the world) where the children have no extended family member caring for them at all, and precious little loving care at all. These are the children my own children have cared for when they were in Africa. These are the children my children are now adopting, taking into their Covenant homes to raise in the Lord. What started it (so far, we have two African grandchildren, with a third on the way) was daughter Michal caring for children in a Zambian orphanage. She saw the needs of those children--they simply sat in their dirty cribs, day after day, with no one picking them up, hugging them, playing with them, or loving them, and those sad and hollow eyes--and she called her family members to adopt them as an act of obedience to the Lord. We thought she was right, so we've done so. You might think of us as your dead African neighbors' extended white American family. Once, in Rwanda, a wealthy Kenyan Anglican woman was condemning white Westerners for trying to steal her country's wealth by taking their children (she meant adopting their children). She was on the boards of several orphanages, so I described what I'd seen recently in an African orphanage. It wasn't good. Then I reminded her of our Lord's statements concerning the least of these, asking her how she could do anything but rejoice and give thanks to God for the believers in America who wanted to love and care for African orphans; and who did it, not to steal Africa's wealth, but to share their own and to raise up a godly seed? To her credit she said she would rethink things, and I hope she has. Certainly the African view of children as precious wealth is far closer to the teaching of God's Word than the American view of them as designer options, but her view of Christians adopting children as theft of her continent's wealth was a bit over the top. The problem isn't that African orphans adopted by American believers have lost their extended family members, but that their extended family members have white faces, now, instead of black. Yet those white faces belong to them more than the black faces they used to call their own because the white faces are their many fathers and mothers, brothers and sisters, sons and daughters, grandmothers and grandfathers in Christ. Water (the water of Baptism) should be thicker than blood (the blood of physical descent). As for American Christians supporting African fathers caring for African children, you’re quite right. Yet there's a limit to the ability of one man and his wife to love, personally. And then there’s the boarding school phenomenon that has bred sexual perversion at horrendous rates. All this to say I think the real need in both Africa and the Western world is for Christian families to model ourselves after the arms of Jesus. He never turned children away. Over the years, my wife and I have had a number of children live with us, and we hope to have a number more before we reach the quiet years. Send us some. We're your brothers in Christ, so we're your extended family--even more than your blood relatives--and we have time and love and food and shelter to care for the children of our brothers-in-Christ. Speaking of extended families, ours gathers once or twice a year for a family reunion we now number over 100. That's just my wife's parents and their direct descendants. And even here where AIDS has not decimated us, we take the children of our brothers and sisters into our homes. Maybe fewer than in Africa, but the Biblical way of doing family exists here in these United States. Also, our parents live with us in their old age. My Dad's sister lived in our home the last six years of her life when she could no longer care for herself. My wife and daughters nursed her. And my mother and my wife's mother, both in their nineties, just spent a week with us--my mother lives in my brother David's home now that she can't care for herself. Note the one time our Lord mentioned the Fifth Commandment, it was to call grown children to care for their aged parents. This is perceptive, timely and relevant to us.It is a worthwhile arcticle for internalisation and practice. Reading your comments tells me that you did not understand what I was saying. You read it through your culturally tinted glasses and failed to see that “fathers”, “mothers,” etc, in the African extended family system is not the “fathers”, “mothers”, etc, gathered around a turkey during Thanksgiving! It is a welfare system, just like the state system—with obligations and penalties in the clan and tribe. Perhaps I needed to add a paragraph like this: “My father’s sisters are not my mothers, they are my aunts, and my mother’s brothers are not my fathers, but my uncles. Similarly, their children are not my brothers and sisters, they are my cousins. And when we come to the next generation, their children are not my children, but my nephews and nieces. They stand in a different relationship with me compared to the grandchildren of my father’s brothers and my mother’s sisters. Let me repeat. It is a support system, like the state welfare system. What about the question of abuse which you allude to (e.g. children taken into the home of the extended family member only to be abused and raped day after day and year after year, children in an extended family member's home who are really still street children, the horror of African homes, etc)? The answer is precisely the same one that you give to those who abuse the state system. It is not by dismantling the system or bypassing it, but rather it is by punishing the offenders so that others may take warning. It is amazing how in the Bible the Christians were exhorted to submit to governing authorities when the ultimate governing authority at that time was a total despot (i.e. Emperor Nero). Human failure should not negate the systems God has given us in his common grace. Rather, those of us who are Christians must be salt and light in whichever context God places us. We African Christians need to be salt and light in our extended family welfare system, just as you, our Western brothers and sisters, are salt and light in the state welfare context. So, may I suggest that you reread my blog and try to understand my world by standing in my place. If anything sounds senseless, it is most likely because of where you are standing rather than where I am standing. In the meantime, remember, I am not saying that you or your daughter should not adopt or start a Christian orphanage here. I am saying, while you are doing that, please help us (your Christian brothers and sisters) to look after the orphans within our African extended family system. I want to assure you that it is more natural to us, and your dollars will go much, much further. We will impact them with the gospel and, because they are still here, they will grow up not only to help their “siblings” but also develop our nation instead of America. It is not either-or, but both-and. Thanks! 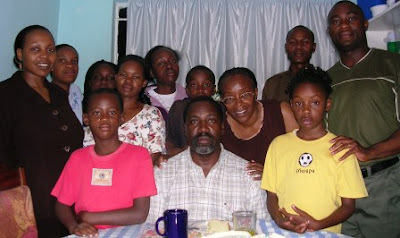 I really appreciate and admire the African ways of extended family loving and caring just the same as a nuclear family. As a parent in the Western world of an African child, I agree that it is paramount that we recognize African values & tradition, as well as also finding ways to support it continuing. >>So, may I suggest that you reread my blog and try to understand my world by standing in my place. Dear Brother, I already understood the points you thought I needed clarified, and yet, somehow, I can't get away from the impression you believe adoption to be second best. Also, speaking of cultural contexts, most Americans are scratching their heads at your understanding of the American welfare system. Adoption is second best! Why take a child's motherland, language, culture, relatives away from them if they can be supported in a much better way without that loss? Thank you for opening my mind to truths that I was previously unaware of. I would like to ask: How do we move forward in helping our African brothers and sisters to look after the orphans within their African extended family system? Hello, thanks for posting your thoughts on this here. Can I repost segments on this for adoptive and preadoptive parents to consider on www.wearegraftedin.com? I think it would be helpful to them. By all means, feel free to use this blog to inform those who are thinking of adopting or even already adopting children, whether from Africa or elsewhere. I hope they will also find it helpful. 1. If you already have friends in Africa with whom you have developed a relationship of trust, you could help them with scholarship funds so that they can pay for the educational needs of the orphans in their extended family. 2. If you are aware of a church in Africa that is above board in its financial dealings, you may want to partner with them in channeling scholarship funds to individuals who are presently stuck for lack of funds. For instance, our church has a number of teenagers and young adults who have finished high school but are presently doing nothing simply because their "fathers" and "mothers" cannot afford to pay for their college or university fees. 3. If you know of a school, college or university in Africa that already has credible credentials. You could help them build their scholarship fund so that they can take in orphans who would not have been paid for by their "fathers" and "mothers" in the extended family system. I emphasise trust, above-board financial dealings and credibility because, due to our fallen human nature, there will always be individuals, churches and institutions who want to cash in on the plight of the poor. Whereas there are some situations that need food and clothing (and we must not overlook that), the goodness with prioritising education is that the individuals who are educated and still remain in our African extended family system will in turn educate their siblings once they finish their studies and start work. Again, this must not be done in competition with adoption or orphanages. It is a third alternative that I am concerned is getting little or no attention. Thanks for asking! We are a non-profit humanitarian aid group that assists families with adoptions from DRC. We also do as much work as possible caring for children in DRC that are left behind in orphanages. Your blog post is an excellent explanation of a family structure that most Americans simply have no concept of, but that we need to better understand and respect. I think your post would be of real benefit to the readers of our website. You have my full permission to link this blog post to your website. I am glad that you have found it useful. As I have said, it is not either-or, but both-and. I can see that you are doing precisely that. Thanks! Thank you sir for your post explaining the extended family culture and how it contrasts to what we understand in the US. It is very different than what it seems on the surface and many Americans do not have a concept of the extended family because it has been long forgotten in our culture. Thank you for helping us to understand. What a wonderful post! Thanks for sharing this information, it is all new to me. I do know several African children who were adopted and now live in the US, and who are thriving in their new families. I love many of them dearly. They are happy and healthy, and having loving relationships with their parents and siblings. In so many ways, this has been good for them. None of that, however, negates the fact that they have also experienced profound loss and continue to deal with that in various ways. Again, I appreciate the information! I think it does have implications on how believers approach the Biblical mandate to care for those in need -- particularly widows and orphans. Your "both-and" approach makes a great deal of sense. Thank you for your article. Being a Social Work student in South Africa, I am extremely grateful for the new perspective you've given me on the care of children in an African context. Pastor Conrad, thank you for this. The North American church has recently come under heavy fire for its "stance" on adoption. While our child is not African, he is adopted and so we follow what's happening around adoption and orphan care rather closely. One of the critical things needed is for families to honor birth culture even if it means slowing down, purposefully making connections and developing an extended network of support, and ensuring that children know who will care for them if something should happen to Papa and Mama. Most of this is counter to North American culture, and your article resonates with me because in many ways I mourn the loss of multi-generational living that we once had in the US. It's not the same as the extended family system, but it's much closer than the frenetic and losely connected lifestyle that we're passing on to our children today. Thank you for this post. It is very helpful. Do you have any organizations or churches you recommend contacting (if we do not currently have friends in Africa)?